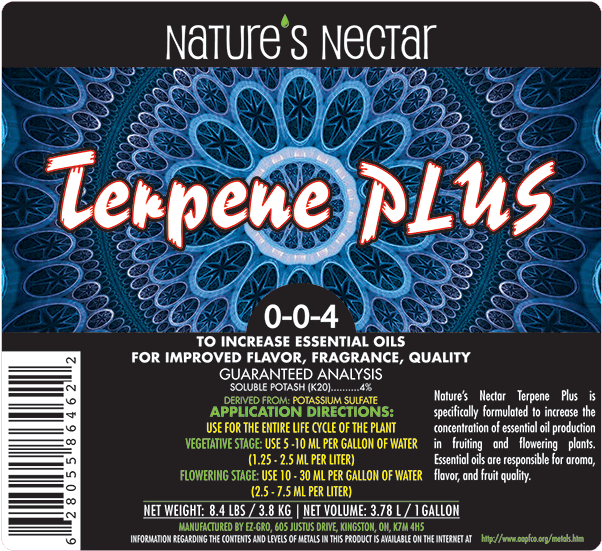 Nature’s Nectar Terpene Plus is specifically formulated to increase the concentration of essential oil production in fruiting and flowering plants. Essential oils are responsible for aroma, flavor, and fruit quality. Nature’s Nectar Terpene Plus can be used in conjunction with the full Nature’s Nectar line for a complete feeding program or as a standalone nitrogen supplement. Vegetative stage and General Purpose: Use at a rate of 1.25-2.5ml per litre (1-2tsp per gallon) of water once per week or with every feeding. Flowering Stage and Heavy Fruiting: Use at a rate of 2.5-7.5ml per litre (2-6tsp per gallon) of water once per week or with every feeding. Vegetative stage and General Purpose: Use at a rate of 1.25-2.5ml per litre (1-2tsp per gallon) of water twice per week. Flowering Stage and Heavy Fruiting: Use at a rate of 2.5-7.5ml per litre (2-6tsp per gallon) of water twice per week.